Hi friends. Finally we are done with the Basics of Options. 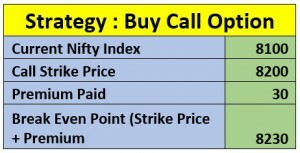 Today we will start the much awaited Options Strategies. We will take one strategy at a time. Initial few strategies are very very easy and I am sure most of you must be using them in your daily trading. Irrespective of that, we will still cover those for our friends who are new to the options trading. But I request you all, please do not hesitate to ask questions if you have even the slightest doubt. So without further delay let’s take up the first strategy and the easiest strategy. 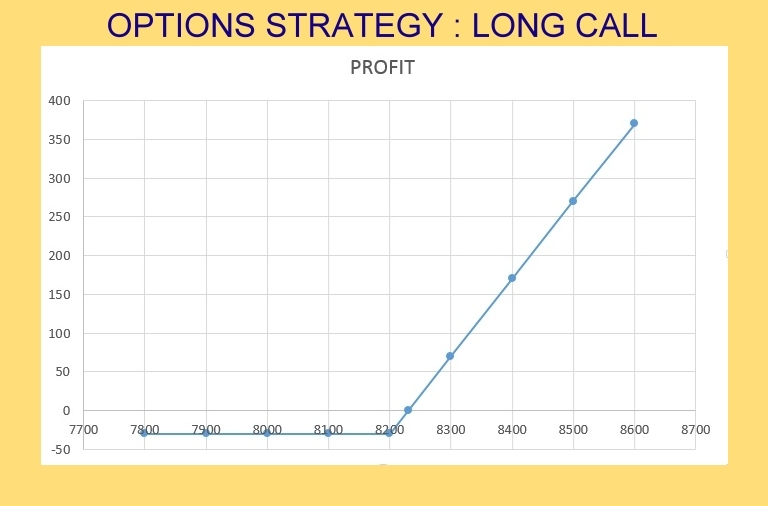 The long call strategy is the most basic option trading strategy. In this strategy, the options trader who buys a call option, believes that the price of the underlying security will rise significantly beyond the strike price before the Options contract expires. This strategy is for aggressive traders who are extremely bullish on the stock / index and want to exploit the perceived upside trend with limited risk of loss. Risk is minimal and is only limited to the premium at which we purchased the call. The maximum loss that we can incur is the loss of the premium. Unlimited profits as the stock or index can rise to any level before the expiry. NIFTY is currently trading around 8100. Let’s assume you are extremely bullish on NIFTY. So you buy one lot of (In The Money) current month Call with 8200 strike price for a premium of Rs. 30. If the Nifty goes above 8200, you will make a net profit (after deducting the premium) on exercising the option. 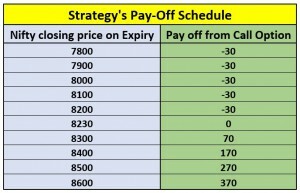 In case the Nifty stays below 8200, it will expire worthless and you will make a maximum loss of the premium of Rs. 30 x The lot size. The Long Call strategy limits the risk of the loss to the premium paid by us for a particular call option (Rs. 30 in our case). But the potential to earn profits is unlimited if the Nifty rises beyond 8200 strike price. This strategy is the simplest way to earn money if you believe that the market will move upwards. The point to be noted here is that once the call becomes In-the-Money, it gains value very quickly as the underlying moves up.